How much can you save with a home solar power system? Some of our customers have reported savings in the thousands. Frankly, many of our customers do see savings by making the switch to solar, and there are more actions you can take to increase your savings; however, it’s important to understand what your solar potential is before you go out and purchase the best solar energy system you can find from the first solar power company online. This is a long-term investment in your energy and future. We strongly suggest you do your due diligence. In this post, we’ll share how you can determine your home solar system potential. You can find question one in part one: how energy efficient is my home? Ready to make the switch to solar? Give West Coast Solar a call today! We proudly service Sacramento, and we’re ready to help you! Otherwise, continue reading to learn more! Question #2 – What is your solar potential? This is a question commonly skipped by those searching for the best home solar power system. Typically, they go straight to a solar power companies they’ve discovered online and start getting quotes without knowing exactly what they can actually install at their residence. There are a number of factors to consider when installing a new solar power system at your home. The first question in this blog series asked about the energy efficiency of your home. Can you make it more efficient before installing a solar energy system? How much less energy can you use once your home is efficient? Nonetheless, you need to determine the best you can how large of a system you can install before calling a company. Nearby trees, obstructions, and buildings – Shade is the main concern here. The peak hours of energy production need to be clear of shade or obstruction for the solar panels to get direct light. In some case, customers have trimmed trees to get the best angle for their panels. Age of your roof – Can your roof handle the extra weight of a solar energy system? This is a serious questions with safety consequences if this is not addressed prior to installation. Call a local roofing contractor to inspect your roof. Homeowners association (HOA) – It’s surprising, but check with your HOA to see if you’re allowed to install a solar energy system on your home or property. As archaic as it may seem, some HOAs do not allow components or equipment to be installed on the roof or around the property, even though it helps the environment and community. Consider any other factors that may obstruct direct sunlight for your future solar panels. Also, make sure that access to your system is limited to you and whomever else in your home that will be helping manage and maintain it. It might come as a surprise, but if you get an inordinate amount of wind, it may call for a more structurally sound installation to protect your system from wind damage, too. 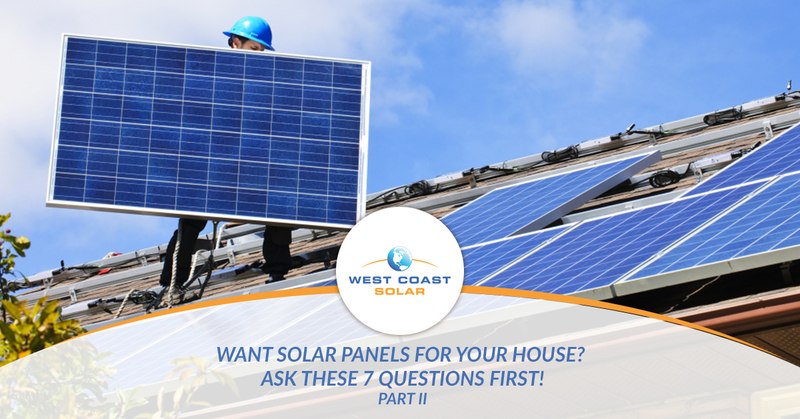 West Coast Solar is here to help you make the switch to solar, whether you’re a new homeowner, or have been in the same home for 30-plus years. Our experts in solar design and installation and make the most out of your home’s solar potential. In part three of this blog series, we will discuss financing options to purchase your home system. If you’re ready to talk now, give us a call! Otherwise, continue reading this blog series to learn more.